"Winding" redirects here. For other uses, see Winding (disambiguation). An electromagnetic coil is an electrical conductor such as a wire in the shape of a coil, spiral or helix. Electromagnetic coils are used in electrical engineering, in applications where electric currents interact with magnetic fields, in devices such as electric motors, generators, inductors, electromagnets, transformers, and sensor coils. Either an electric current is passed through the wire of the coil to generate a magnetic field, or conversely an external time-varying magnetic field through the interior of the coil generates an EMF (voltage) in the conductor. A current through any conductor creates a circular magnetic field around the conductor due to Ampere's law. The advantage of using the coil shape is that it increases the strength of magnetic field produced by a given current. The magnetic fields generated by the separate turns of wire all pass through the center of the coil and add (superpose) to produce a strong field there. The more turns of wire, the stronger the field produced. Conversely, a changing external magnetic flux induces a voltage in a conductor such as a wire, due to Faraday's law of induction. The induced voltage can be increased by winding the wire into a coil, because the field lines intersect the circuit multiple times. The direction of the magnetic field produced by a coil can be determined by the right hand grip rule. If the fingers of the right hand are wrapped around the magnetic core of a coil in the direction of conventional current through the wire, the thumb will point in the direction the magnetic field lines pass through the coil. The end of a magnetic core from which the field lines emerge is defined to be the North pole. There are many different types of coils used in electric and electronic equipment. 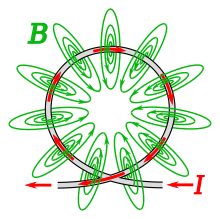 In a coil of multiple turns of wire the magnetic field of the turns adds in the center of the coil, creating a strong field. This drawing shows a cross section through the center of the coil. The crosses are wires in which current is moving into the page; the dots are wires in which current is emerging from the page.